The two Rottweilers, very well behaved now — they obey that wisp of a woman, heel, incredible. And you see, that's why I don't like dogs, one minute they're practically tearing your head off, and the next they're pandering to you — if that's what you're looking for, you might as well just stick with people. 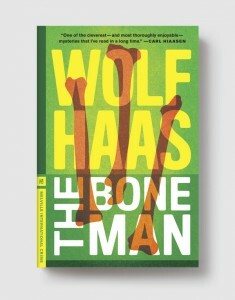 — from The Bone Man, by Wolf Haas. I really enjoyed the narrator first time out in Brenner and God. But this time, you know, starting to grate. So I gave it a rest for a couple days, let the stress dissipate — not the stress of the book, I was more or less enjoying that, but the stresses of life and such I mean — drank it away, really. And now I'm in love with the narrator all over again. Also, craving fried chicken and a beer. "Now that's just showing off"